Through the good offices of Boeing we are able to reproduce the following article from the distinguished American publication Aviation Week & Space Technology. It is written by Guy Norris, once of Flight International. Boeing is approaching one of the riskiest early stages of the 787 flight-test programme that, so far, is either meeting or exceeding expectations-including earlier-than-ever autoland tests, the company says. "If you go look back at the history of flight testing, people have found things in a lot of different areas, and flutter is one that really stands out on any programme," says Scott Fancher, 787 Vice President and General Manager. "So we will be doing flutter testing here over the next six weeks-and once we get past flutter testing, it is a risk-inflection point." However, beyond this, "there are other areas" of potential surprise, he says. Tests such as rejected takeoff and other high-energy trials will be key focus points. "Autoland is always exacting, but the good news is we've already done it. ZA001 and 002 have done multiple autolands, and that's the earliest we've ever done it," says Fancher. Initial tests included both inertial navigation system (INS) and GPS-aided landings, with ZA002 recently conducting crosswind autolands. Overall software and systems performance has also been better than expected. "When we first started flying, I was expecting a lot of software problems. Now it turns out when we started ground testing the real aircraft, we saw very few problems-it looks like this investment is paying off," says Fancher. Based on a function of test points per flight hour, "we're right on the optimum curve for efficiency." To Fancher, this indicates the aircraft is "very stable from a systems and software perspective." Flight crews say, "What's dominating their efficiency is getting to clear airspace – it's not the aircraft," says Fancher. While acknowledging that the imminent doubling of the test fleet with the addition of ZA003 and 004 will also double the potential for problems, Fancher says "the good news is that they're all the same configuration functionally in terms of software. We've been exercising [the initial two] aircraft aggressively from a systems standpoint, so the risk of finding things is coming to the point where it starts to come down. Clearly, as you get more time on multiple aircraft, we'll be finding those random things; but as far as the basic stability is concerned, we're satisfied." Two systems-architecture features of the 787 coming into play in the early flight-test effort include the built-in test and "self-healing" systems, says Fancher. "We've been pleased with the ability of the aircraft to isolate when they fail; and the other aspect is the self-healing systems where failures are transparent to the pilot. The aircraft is simply reconfiguring itself because of its double or triple redundancy, and never notifying the flight crew because they don't need to know. The maintenance guys download it and decide if it's something that needs fixing now or later." Against this background, Fancher concedes there are systems issues. "Is it perfect? No. There are always things you anticipate that you will have to fine-tune." The pressurization system has required "fine-tuning in the air and on the ground," after 787 Chief Test Pilot Mike Carriker commented that the system generated distinct "popping" sounds in the structure with pressure changes. The all-electric, liquid-cooled environmental control system is very different, says Fancher. "But even with these differences, these sorts of issues are still in the realm of those we'd expect." Paradoxically, some of the most complex areas – such as the software – intensive common core system [CCS] at the heart of the 787's avionics and systems architecture – have proved robust and stable. "The CCS has been rock solid for us," he adds. 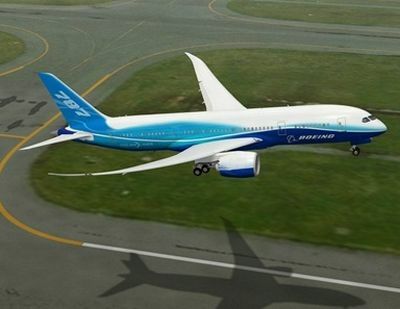 Meanwhile, Boeing is preparing ZA003 and 004 for flight. ZA003 contains a partially complete development version of the new-look interior, and is dedicated to the "passenger experience" segment of the development and certification programme. The use of a full-up development interior in an aircraft this early in the test programme is "unprecedented," says 787 Interiors Director Tom Galantowicz. "It was a bold decision, because the cost and disruption across the flight test programme are significant," he notes. "It is important to us because it gives us the best opportunity to make sure the airlines get a satisfying product. [This is] how we can be assured [of success], particularly with all this new technology and architecture." In addition to partial cabin sections forward and aft containing 135 seats, the interior includes multiple lavatories and two crew-rest areas in the crown section. The aircraft's mid-cabin also houses instrumentation racks, flight test equipment and work stations. At the Everett assembly line, "production is ramping up and we're making progress – although as we'd expect, we are running into challenges and we're solving them," says Fancher. Significant advancements in Boeing's steep learning curve with the 787 production system are visible on two of the four aircraft currently in Building 40-26. The 15th aircraft on the line, in the second assembly position, is the first 787 to have arrived from Boeing's Charleston, S.C., facility with a pre-painted centre fuselage. The empennage is now the only remaining major structural sub-assembly still to be pre-painted before delivery to Everett. Painting protects the composite structure from damaging ultraviolet light. The 16th aircraft, now in the first assembly position, is the first to arrive with the side-of-body wing-root modification already installed. The work (performed at Charleston) is gradually being completed on other 787s at Aviation Technical Services, an adjacent maintenance facility on Paine Field, or in temporary hangars on the Boeing flight line.